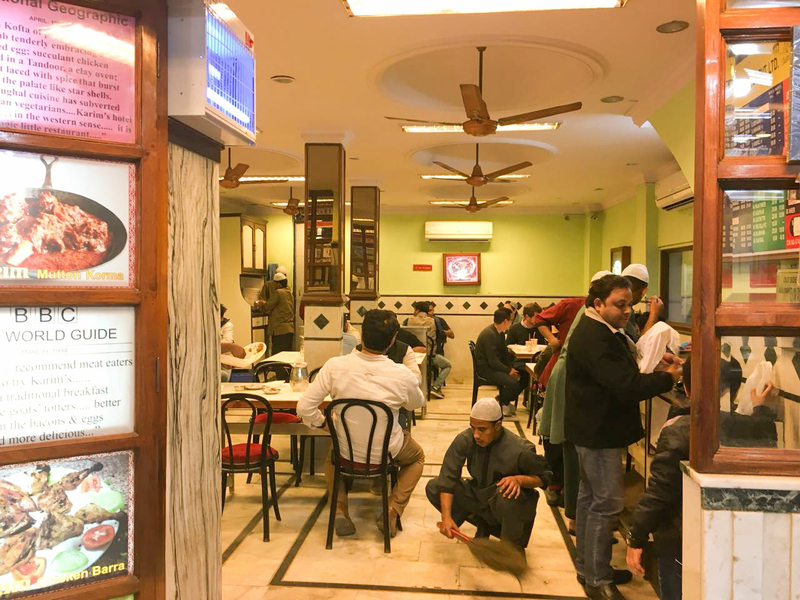 Foodwalk near Jama Masjid: Karim’s Mughlai restaurant in Delhi, the old city! I am trying hard to remember where did I first learn about Karim’s New Delhi. But memory fails me. Was it the dawat of wazwan while treading on the balmy evening walks by the Daal lake of Kashmir, I came across the name Karim? It was 2012. Back then, I was neither a travel blogger, nor a smart phone user. The fact is, Srinagar does have a place named Karims. 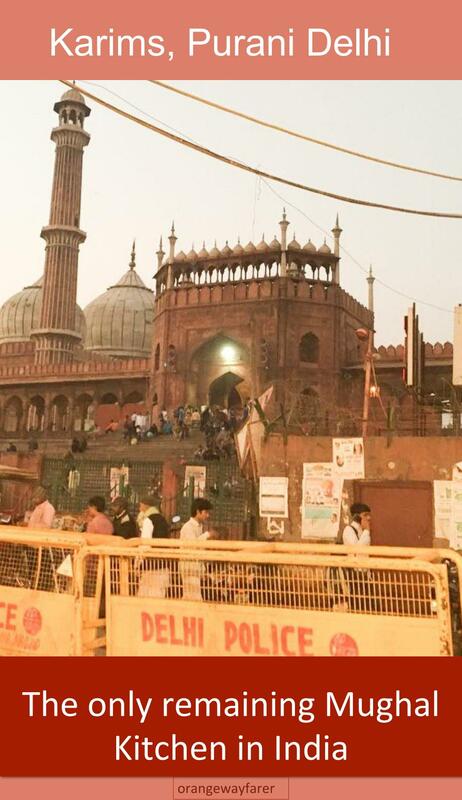 However, I cannot fact check if that is an ally with the old one I discovered at the foodwalk near Jama Masjid! It has been more than 5 years I had walked in the streets of old Delhi. The myriad smell, dust, warm vignette and an agony of lost time remains in my mind. “My mother was born in red fort. She used to be called a Muhajir.”I remember my friend saying this in office. In my mind, I knew I had to travel the expanse of Gurgaon to Purani Delhi in the coming Saturday, experience the remains of the Mughals’ pride. 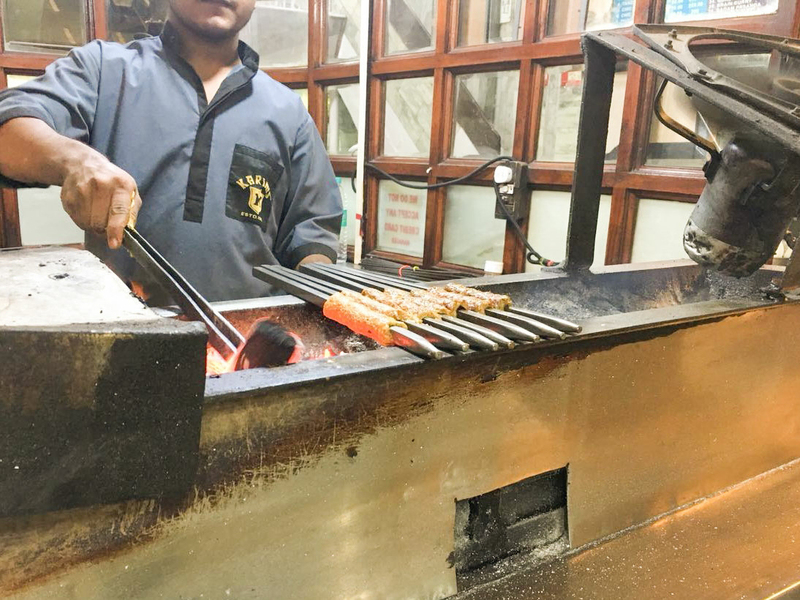 Sheekkebab being grilled in front of the restaurant, Karim’s New Delhi! 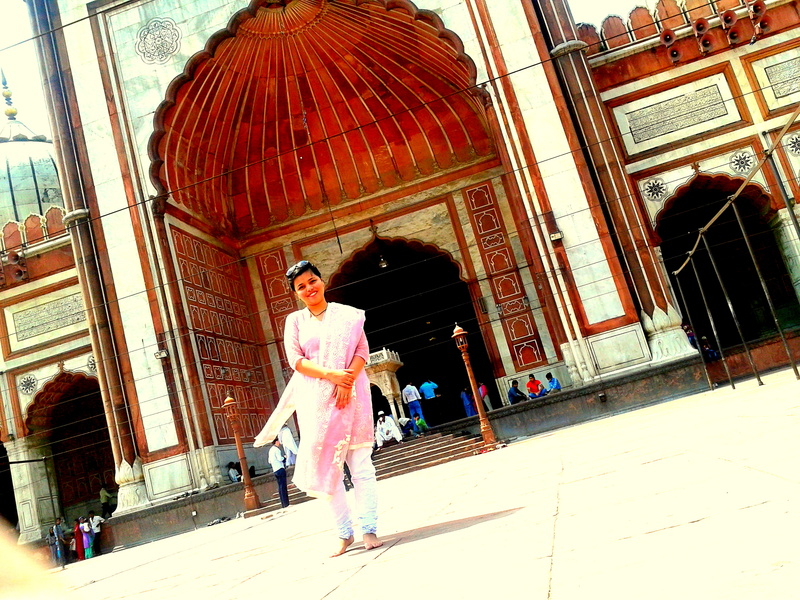 Discovering Karims at Purani Delhi, a serendipity! Sated after exploring the marble inscriptions with Minakari work, which I had otherwise seen only in wedding Benarasi sarees and conch shell made Shanka Pola for married Bengali Hindu women, I felt hungry. A walk across the street seemed a great idea for the place was thriving with life. This happens in India, I suppose. You can stand at a manicured garden, pretty landscape, look at a distance and experience a pulp of life, whirling with many emotions and paving way for the next moment. Do you want to be a part of the frenzy? “Hell, yes!” I would exclaim in my mind unequivocally. This is Shahjahanabad, Delhi. The Mughal’s capital. 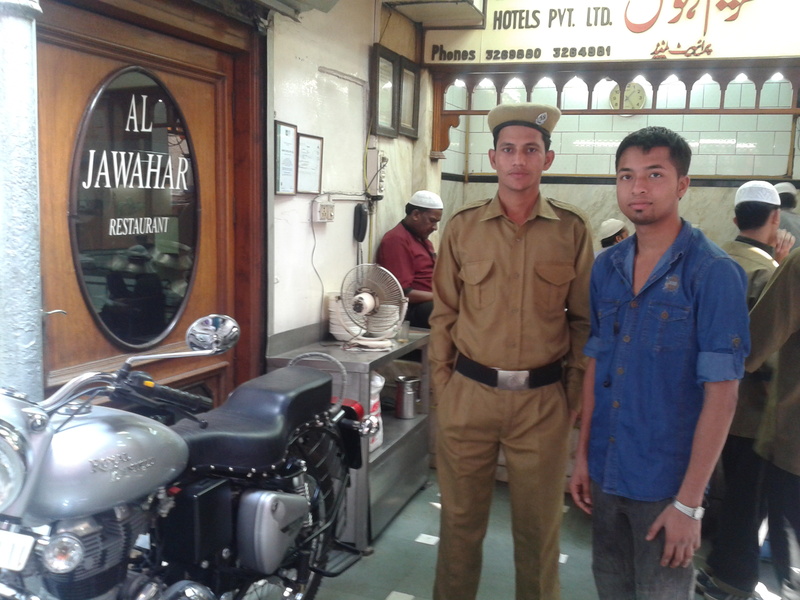 My brother standing with a security person of the restaurant! circa 2012! A map to help you navigate through a maddening crowd! Instead, I propose a walk in the labyrinth that Purani Delhi is! Shahjahanabad ! The walled city the Sultan had made with lofty aspirations. River Yamuna at one gate, one gate named after Lahore. Neither Yamuna flows by the side, nor can Lahore be accessed through the gate any longer. Such is the gnaw of time. The once mighty mansions of royals of the court now houses courtesans. There had been many serendipitous encounters while exploring the adjacent lanes. I picked up dainty ear rings that Deepika Padukone styled with her Ghagra Choli in the movie Raam Leela. A house with distinct stone wall astounded me. and further, I came to know that was the residence of Mirja Ghalib, the magician with Urdu words. A Bengali sweet shop named Maa Annapurna sells Mishti Doi. A million rickshaw puller manages to pull curious visitors in the allies. A few beggars here and there. Children come up to you with a rose in hand and snorts from a nostrils, touching yours dupatta and asking you for ten rupees. 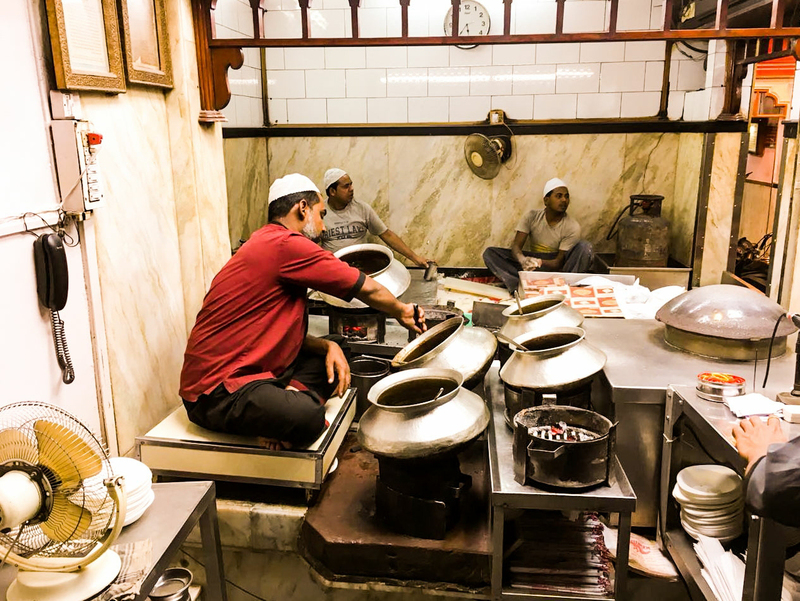 Jama masjid foodwalk is a quintessential best of the country! The hunger strikes again and I remember I was searching for food. And, even after writing for around 500 words, i cannot remember how I found Karims! Did I know about the place? Did I read about it? Someone suggested Karims? I do not know. But Karims happened. Like all good things happen in life, mostly unexplained. Back then, zomato was not a thing either! All that I remember was, I found Karims the restaurant and felt elated! For the uninitiated, Karims is an dining place which is managed by the chefs who had conjured exotic ingredients to assemble Babur’s meals! No matter how sad Sanjay Leela Bansali had portrayed Khilji’s dining manners (remember the scene where he is biting on a chuck of meat, much like Leonardo did for the blooded liver in the reverent? ), Sultans sure knew the art of gourmet. What caught my fancy at first was the remarkable cleanliness. 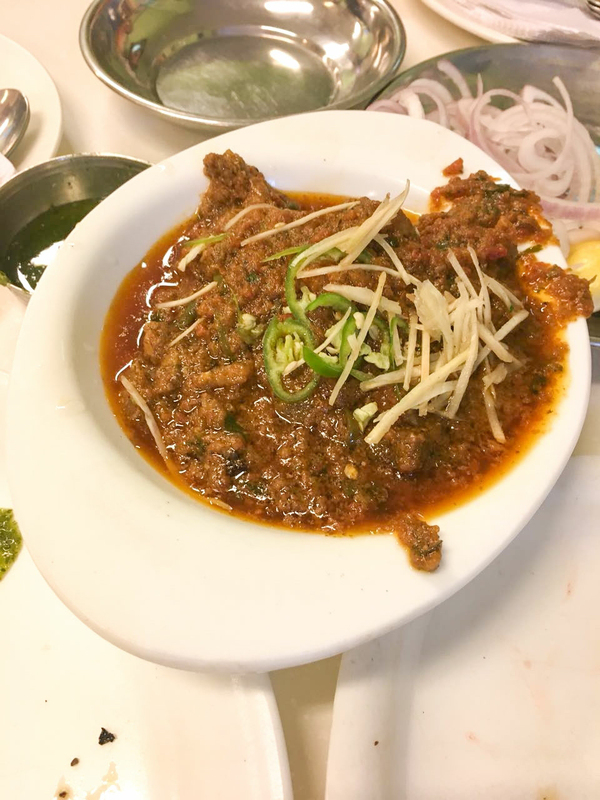 Among accolades from BBC world traveler and other esteemed institutes, Karim shows a world of diners who appreciate Mutton Burra with warm breads, frshly baked from Tandoor just as they appreciate and protect things from the days of yore. An open kitchen at the entrance of Karims. Want to binge on Mughlai food in Bangalore? Wait till Eid beckons! There are huge, endless Handis with meat gravies in warm hues. From dark red to bright orange, the gravies show dollops of butter swimming atop and ready to be devoured. Ceiling fans, ivory while in color, are hanging from tall walls. Walls have photos of the likes of Dilip Kumar (i fell in love with him after watching Mughal e azam) and M F Hussain. Legend has it there iftaar parties were incomplete till the time Karim’s sheek kebab would reach the Majlish. The courtyard has multiple tandoor and hustle-bustle of service men running between the main kitchen and parcel counter and dining halls. Sleek rot iron chair be-seats the hungry visitors, cools them off with ceiling fan breeze and a touch of air conditioning. The afternoon and evening rush hours will make you stand in a queue for quite some time. Once you have secured your sit, be sure to read every detail of the menu card. Notice the pride the hotel from Matiya Mahal road take in mentioning the name of the Mughal Sultanate. The Indian uprising of 1957 had resulted in a shocker to the British raj and the last Mughal emperor, Bahadur Shah Zafar was exiled in Rangoon, present day Myanmar. 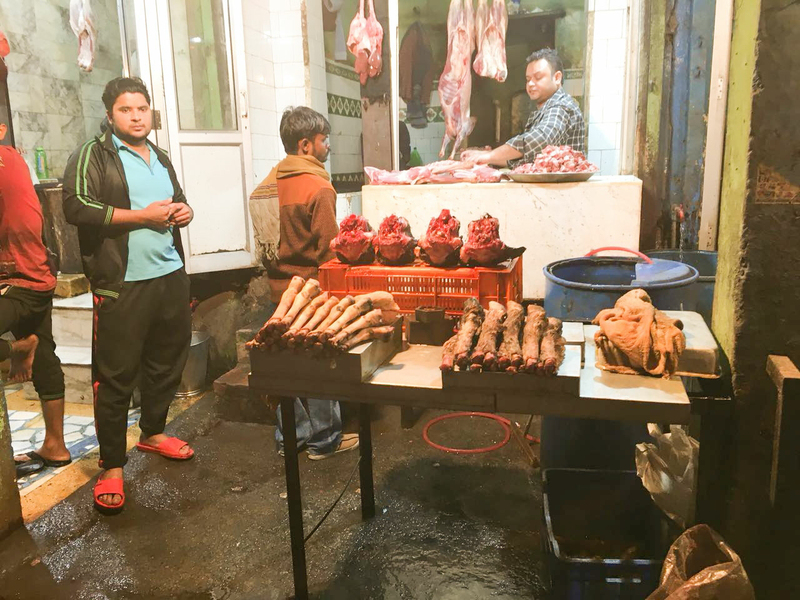 Chef Mohammad Awaiz fled in the turbulence and settled in a tiny unnamed village near Ghaziabad and engaged in different livelihood. However, his choice for the finest spices to match with the best ingredient for everyday’s meal descended down to his heirs. Haji Karimuddin returned to the walled city of old Delhi at the onset of coronation of King George V in Delhi in 1911, opened his humble food stall. What people love grows faster and bigger. Soon, they laid the first brick of the legendary restaurant which these days has its name highlighted in bold red as Karims. The Bangladeshi middle aged man sitting by my side described how the qorma, nahari, mutton burra, kebab and all the good stuff largely remain unchanged! I feel awestruck as the man belongs to the country of Hilsa and steamed rice, if not Shidol Shutki(dried prawn)! And, with the first bite of my food and I know I am coming back here, everyday if possible. Or may be, shift my home from Gurgaon to Purani Dilli? 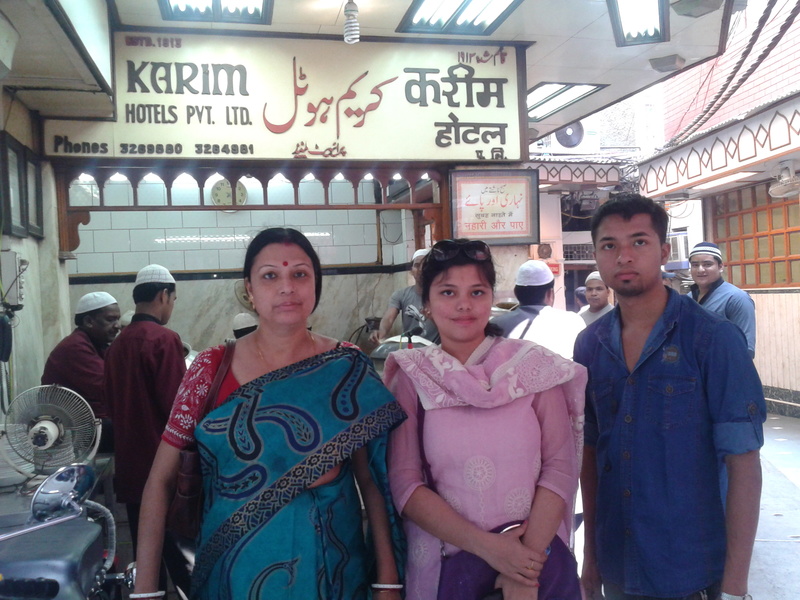 What should you eat when you are eating at Karim’s, Jama Masjid? The owner of the restaurant, Fakhruddin Ali Ahmed once made a statement, “those who come to our restaurant are not customers but our guests”. Not just lofty words, he stayed true to the claim and went on serving the best of Nahari of this part of the continent for his lifetime. If you are wondering why is Nahari special, you need to picture a red broth in which succulent pieces of meat (mutton in case of Delhi) have been stewed for long and spiced with turmeric and green chilies. Do not miss the gentle potato peeping from the stew. Alu Gosht is a delicacy in its own rights! The royal army from the days of Mughals used to feast on this and garner day’s energy. The fall of empire has had the breakfast dish percolated to the stalls in Motiyabazar which makes the laborers prepare for a eventful day which no other meal heavy with bacon and eggs could do! AI has not had its heydays when it comes to the walled city, city of Djins! It is mutton, mutton qorma. tastes great with naans! My tryst with Karims would generally happen during lunch hours, because Delhi was never the safe abode where I felt secure roaming freely. But, that story may await! I would pick up a book or two from the streets of Dariyaganj, walk to Jama Mosque, People watch and have lunch at Karims. My lunch would invariably contain Kacchi Biryani, along with Chicken Jehangiri. Kacchi Biryani from karims is pretty distinct in its mild, lime yellow appearance and tastes gentle. The Chicken dish in jehangiri is ethereal! They must serve you something like this in jannat. Otherwise, no point of leaving the world. It is chicken cooked in almond gravy and dollops of Desi Ghee. There were days, I wanted to experiment and had ordered the Mutton Rogon Josh. Since the first I heard of Karims was when I was traveling in Kashmir, this quintessential Koshur dish had to be tasted. It was decent. For the brave souls, I suggest the goat Brain curry! I did not like the buttery texture but many described the taste to be similar of the insides of a lobster’s head (Does not make sense, right? I know!)! The goat curry of the country has intrigued many people over the years! While I will always be partial to the Bengali styled Mutton Kosha, I highly recommend trying the Mutton Qorma from Karim’s with those freshly baked naans, delivered from the tandoor. They will not disappoint you either. Plenty of resources for the Kebabs nearby. Grilled meat shall not cause you health hazards either! Dont miss the goat trotters for paya! It is not a fine dine place however an institution by itself. Hence expect to pay a higher price than the neighboring eateries (Al Jawahar Restaurant being one remarkable one). A long queue is expected. So is a long walk awaits among an army of rickshaw pullers if you want to withdraw cash from a nearby ATM. 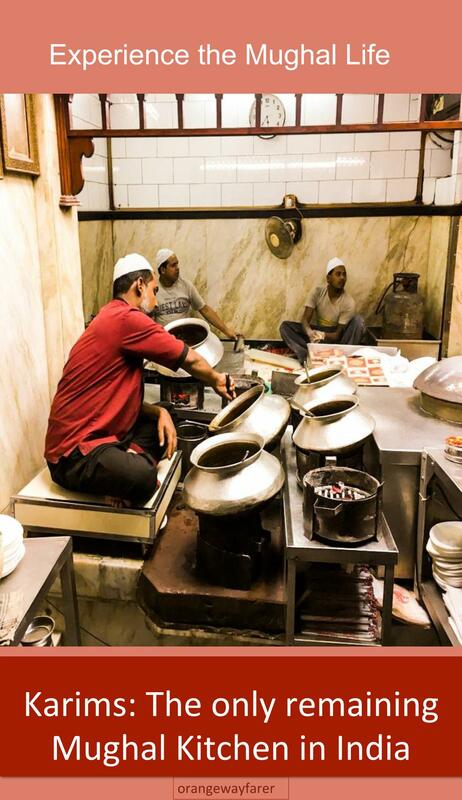 Also, a Jama Masjid adjacent food-walk will show you plenty of other specialty restaurants. If you are confident on of your stomach, do not hesitate to try! Strongly recommend to carry a bottle of water. Also read about the best of Bangalore food scene during eid here! Loved the read? Pin it here! 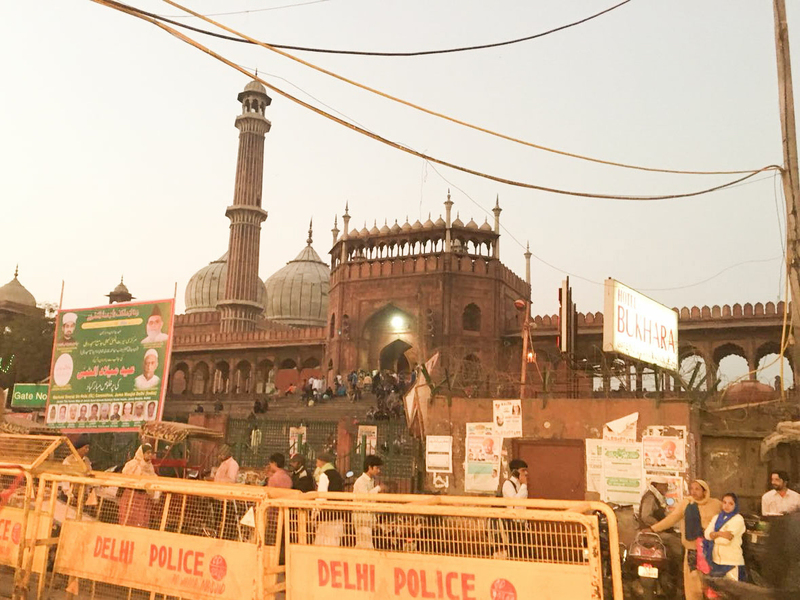 Jama Masjid and the point from where your authentic Mughlai food quest should start! Want to read some great poems? Want to book a stay in Delhi? This post may contains affiliate links. Please read the disclosure post. Sounds like a very interesting dining experience. Not sure about goat brain curry! I think I might struggle with that as a vegan, haha. The naan looks good though! Thanks for this insight. Even I did not and cannot try goat brain curry! While not a vegan, my choice is always fish diet. But I surely loved the chicken curries of the place. Great post! Those dishes sound wonderfully unique, makes for a memorable experience I’m sure. Thanks for sharing your tips! , I love your writing style – I could visualize the scenes you were describing without even looking at the photos. That also means I’m now starving – love Indian food. One of the big reasons I want to go to India is food!! I always love foodie guides. Thanks so much for this! 😀 In every honesty, I try and avoid Indian food, but Karims in an exception. I love the Chinese they cook in India! (Indian-Chinese is a real thing). Aw! I love that your family joined you too. The curries sounded amazing! Every time they will come here, every single time! 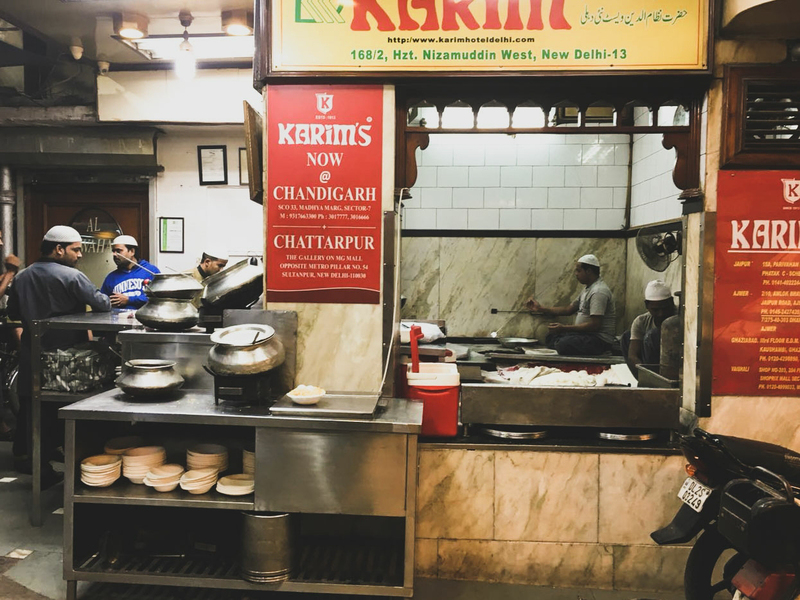 I’ve just got back from my first trip to Delhi and would have loved to have known of a local gem like Karim’s. Maybe I’ll get there on my next visit! Aww. 🙁 too bad lady, I know. But now on, you know hwere to go. Or may be suggest a person to visit? That naan looks ridiculously amazing. It seems like this place has a nice vibe of not being too fancy, but not street food either. Unfortunately as a vegetarian I wouldn’t be able to eat the mutton or goat curries, but I know my carnivore travel buddy would be first in line at this place! This is very very old school, you know. And it retains a certain sense of pride, un-matchable with other places. The Naan is good, for sure. Fresh and baked in tandoor. Very interesting and informative post! 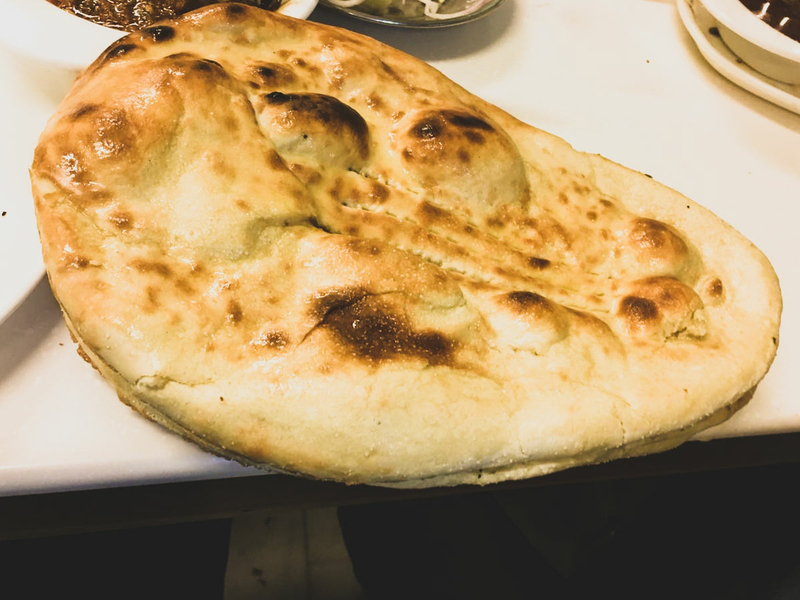 Naan breads are some of my favorite foods! Probably not the healthiest but on the other hand not the most unhealthiest either. Hahaha. This is not what one may call healthy but surely what I call sumptuous! I never heard about these dishes and yet want to try them. Very interesting read because of many cultural differences I’m not familiar with. The royal Mughals and their exquisite taste, I tell you! I heard about it and watch in some travel program but this write up with pictures provides in depth information. 😀 I did not even hear about it. I discovered and then researched and became more overwhelmed! Beautifully written. Especially the choice of poems and description of the place. This should be a must visit. The poem is so beautifully penned, no? Karims is the go to place, in the entire Delhi. I insist! I read food and I’m happy already. 🙂 I’m a huge foodie, can’t plan a trip to somewhere without searching their typical dishes! 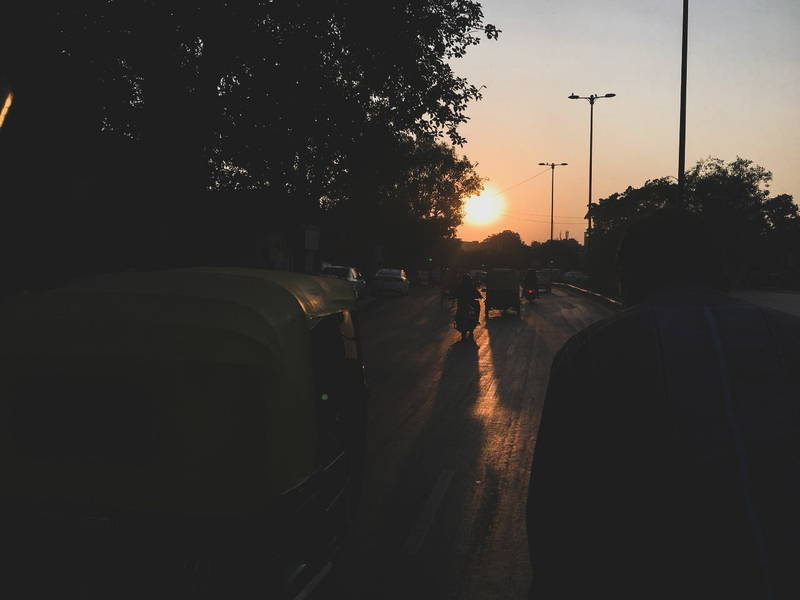 Delhi looks like such an interesting place, full of culture, and good foods to try. I appreciate the nice tips! Delhi, especially the Purali Dilli (the old city), the city of Djins is mind blowing. This is a post for nostalgia… Brilliantly penned down. Such an interesting read! And the food looks great, your photos are really good! Wonderful information. Wish I had it before I went to Delhi but I know I will be back. Thanks!! 😀 It is serendipity! I tell you!